This Hebrew tattoo, which was discovered and sent in by Leor, is supposed to say "Lord give me strength". I have to admit, it is grammatically correct. Out poor victim made the mistake of trying to render it vertically, though, all by herself. Bad idea! Below is how "Lord give me strength" is supposed to be written in Hebrew. They're the exact same words as in the tat. Can you spot what went wrong? Mistake #1: This Hebrew tattoo is backwards. 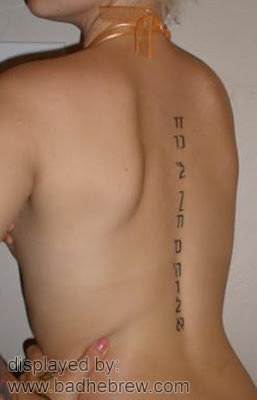 Unlike English, Hebrew is written right-to-left, so the rightmost letter should be on top, in a vertical tattoo. Mistake #3: Some letters were replaced by other, similar looking letters. So you can very well read the word "Ten" (give) as "Chen" (grace), and you can read "Koach" (strength) as either "Noach" (comfy) or "Moach" (brain). Yeah, this tattoo could absolutely be read as "Lord give me brains". Vertical Hebrew tattoos? Kids, don't do them!